Leafy spurge is a long-lived perennial plant that can grow up to 3 feet tall. The leaves are long, narrow, and about 4 inches long. Leaf edges are smooth, hairless, and wider toward the tip. They grow in an alternate pattern along numerous smooth stems that produce multiple branches near the top. The stems and leaves are filled with white sap that oozes when the plant is broken. The flowers are a bright yellow-green color, tiny and grow above two to three heart-shaped leaf-like structures of the same color. The fruit is a capsule divided into three compartments, each containing numerous small, smooth, gray- to brown-colored seeds. The root system spreads horizontally and vertically to depths up to 30 feet. New plants can emerge from buds along the horizontal roots. The entire plant turns a bright red color in the fall. Type and Class of Livestock: All classes of sheep and goats; not recommended for cattle. Grazing Objective: Remove 95% of top growth; graze regrowth after first treatment; prevent flowering and seed production. Growth Stage for Treatment: Grazing should occur in the vegetative to flowering stage. Sheep may need to learn to eat leafy spurge and prefer younger plants whereas goats readily eat leafy spurge at all growth stages. Potential Effectiveness: Sheep and goats readily eat leafy spurge after it has been introduced into their diets. It is considered to be somewhat toxic to cattle and horses. Sheep and goats are very effective at reducing biomass on an annual basis when leafy spurge is grazed to a moderate to severe level of utilization during the vegetative to flowering stage of growth. Grazing effectiveness can be low the first year as plants can produce a flush of new growth the second year. Suppression of high density infestations will likely occur after four or more consecutive years of grazing treatments. Grazing multiple times per year may be needed in moist or riparian areas. Integrating grazing with herbicides and biological control may provide the most effective strategy for long-term management of leafy spurge. Bartz, S., B. Landgraf, P. Fay, and K. Havstad. 1985. Leafy spurge as a forage component for ewes and lambs. SID Research Digest Winter:39-42. Fay, P.K. 1991. Controlling leafy spurge with animal grazing. In: L. James, J. Evans, M. Ralphs, and R. Child [Eds.]. Noxious range weeds. San Francisco, CA: Westview Press. p. 193-199. Lacey, C.A, R.W. Knott, and P.K. Fay. 1984. Ranchers control leafy spurge. Rangelands 6:202-204. Lacey, J.R. and R.L. Sheley. 1996. Leafy spurge and grass response to picloram and intensive grazing. Journal of Range Management 49:311-314. Lajeunesse, S.R. Sheley, R. Lym, D. Cooksey, C. Duncan, J. Lacey, N. Ress, and M. Ferrell. 1995. Leafy spurge: Biology, ecology and management. Montana State University Extension Service. Extension Bulletin EB 134:25. Landgraf, B.K., P.K. Fay, and K.M. Havstad. 1984. Utilization of leafy spurge by sheep. Weed Science 32:348-352. Lym, R.G. and D.R. Kirby. 1987. Cattle foraging behavior in leafy spurge infested-rangelands. Weed Technology 1:314-318. Lym, R.G., K.K. Sedivec, and D.R. Kirby. 1997. Leafy spurge control with angora goats and herbicides. Journal Range Management 50:123-128. Muller, B., P.K. Fay, and M.K. Petersen. 1990. Feeding leafy spurge to cattle. Proceedings of the Western Society of Weed Science 43:31-33. Olson, B.E. and R.T. Wallander. 1998. Effects of sheep grazing on a leafy spurge-infested Idaho fescue community. Journal Range Management 51:247-252. Olson, B.E., R.T. Wallander, and R.W Knott. 1997. 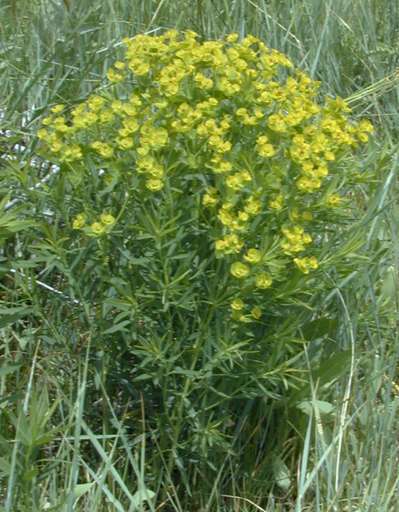 Recovery of leafy spurge seed from sheep. Journal of Range Management 50:10-15. Olson, B.E., and J.R. Lacey. 1994. Sheep: A method for controlling rangeland weeds. Sheep Research Journal (Special Issue):105-112. Sedivec, K., T. Hanson, and C. Heiser. 1995. Controlling leafy spurge using goats and sheep. North Dakota State University Extension Circular R-1093. Stoneberg, S. 1989. Goats make “cents” out of the scourge of leafy spurge. Rangelands 11:264-265. Walker, J.W., K.G. Hemenway, P.G Hatfield, and H.A. Glimp. 1992. Training lambs to be weed eaters: Studies with leafy spurge. Journal of Range Management 45:245-249. Walker, J.W., S.L. Kronberg, S.L. Al-Rowaily, and N.E. West. 1994. Comparison of sheep and goat preferences for leafy spurge. Journal of Range Management 47:429-434.